I hope that 2019 is off to a great start for you, your friends, and your family. The New Year is one of my favorite times of year because it is a time of new beginnings. Whether committing to healthier living or changing a bad habit, January is a great time in our lives for new and fresh starts. We all live in relationship with one another. What a great time to assess your relationships. If you are married, this is a great time to think about your relationship with your spouse. If you are a parent, consider improving your relationship with your children. Perhaps a relationship with a friend needs some tender loving care. I hope that these Relationship Resolutions will help you take stock and nurture and enhance all your relationships. Check out assumptions. Commit to work on issues that create conflict. Listen deeply, honestly, and without judgment. It is a myth that we can read the minds of our loved ones. Let go of grudges and past hurts. Commit to stop hurting one another. Do a favor for someone. Give and receive compliments graciously. Don’t take life so seriously. Give grace to yourself and your relationships. Send flowers, a card, pay for lunch, etc. Be intentional about celebrating rituals together. Be kind in your dealings with each other. Hats have a metaphorical significance and come in all shapes and sizes. Consider some of these figurative hats–there are our work hats, our family hats, the hat we wear when we volunteer, or the hat we wear when we vacation, or work in our flower garden. 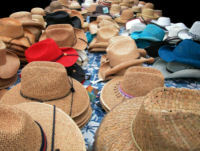 Each hat is adorned with a particular set of skills and responsibilities. Often our strengths and talents for wearing each hat are the same. Our organizational skills can be used whether we are working on a job project, juggling the family’s schedule, or planning a fund-raising event. Teambuilding skills can be an excellent way to help families work out ways to take care of household chores. Strangely enough, hats may call for unique characteristics and qualities. For example our co-workers may become alienated if we wear our parent hat rather than our work hat. Our duplicitous and integrated world makes it crucial to identify each hat we wear. We are so adept at multitasking we must also differentiate each hats’ unique qualities. There is an art to knowing which hat to wear, because trying to wear more than one hat at a time is confusing. In my role as a therapist I not only draw on my theoretical knowledge and training in family systems, but also on the experiences of my life’s journey. The difficulty comes when we try to wear more than one hat at a time, or forget to change from our work hat to our family hat. Sometimes I will say to a client, “I am going to take off my therapist hat, and speak from my vantage point of wearing my parent hat.” This is my way of distinguishing between theory and anecdotal knowledge. At other times I forget to take off my therapy hat, and put my family hat on at the same time. In my “well-meaningness” I become overly helpful. I try to be therapist to my family resulting in family members feeling mistrusted and/or criticized. Children in my practice tell me “I wish my Dad would just be a Dad rather than a businessman,” or “I wish my Mom would just listen and not always be the teacher.” Likewise, employees tire of a co-worker that brings all their personal problems to the workplace. In her book Victoria: The Romance of Hats, Jeanie Larmont writes, “A hat alters the image we have of ourselves and the image others see as well. For the hours we wear it, it brings out a different dimension of our personality.” Think for a moment about the symbolic hats that you wear each day. Give each hat a name and an associated role. What expertise, experience, and talents are needed to keep each hat situated on your head? Identify circumstances that call for a transference of skills. Also, identify the hat that is only worn for special occasions. Do you need to make changes in the hats you wear? Join me as I work to become mindful of the hat I am wearing and only wearing one hat at a time.